New Designers is the UK's leading graduate design exhibition, where the most talented, newly graduated designers come together to showcase their final projects. It takes place over two weeks, with each part focusing on a different set of design disciplines. "All students and staff are really excited about exhibiting at this prestigious event," said Dr Deborah Andrews, course director of BSc Product Design "It's a unique opportunity to promote the university and courses and for the students to meet internationally renowned design professionals. "LSBU students have been head hunted at New Designers in the past and are now employed by successful companies including Dyson, Hasbro and DCA to name a few." The exhibition explores a wide range of themes with all ten students' designs exuding creativity and originality which reflect their individual needs. George Mabey is the inventor of 'The A4 Scooter', a scooter that folds up to fit within the dimensions of an A4 paper, 210mm by 297mm. Its unique folding method uses 2mm Dyneema Rope that is threaded through every section of the scooter. Freddie Paul's 'Beer Tree' design allows consumers to brew their own beer, ready for consumption within two weeks. David Ong has created 'Atolla', a lifestyle product which helps to regulate the user's circadian rhythm to wake up and sleep more effectively. It is a wireless remote controlled lighting system that is attached to standard ceilings. Jack Ogborn's 'Whippet' is a quick release BMX brake system that can be installed in 35 seconds. Whippet provides a simplified brake setup that requires very little time to attach and detach to the bike. Jamie Fairclough's 'Switched On Cycling' targets the urban commuters seeking alternative transport. 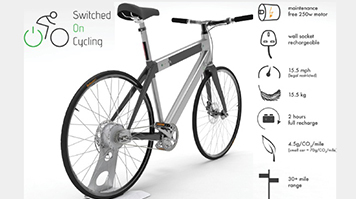 It takes alternative manufacturing processes to create custom-specified bicycle frame geometry with ease of manufacture, culminating in an electric-assisted bicycle. Leon Single's 'Visiospine' consists of a retro-fit seat pad that collects data key spinal locations with three embedded distance sensors, warning users of detrimental posture. Krum Sotirov is exhibiting 'Uvio', a personalised wearable device that quantifies and actively manages the UV exposure levels of each user according to input factors such as age, skin type, weight predisposition, and so on. Miguel Ricciolini's sustainable 'ExtruderLab' is a mini extrusion device that recycles plastics into filament for consumer 3D printers, drastically reducing running costs and carbon footprint. Nima Patel's 'Bac Off' functions by administering a two-part, initially colourless solution that detects bacteria on the hands through a visual indicator. This product meets the needs of a niche market targeting the health professionals and aims to promote the importance of hand hygiene. Max Harvey has designed 'Aquacalm', a flood barrier that zips around the door frame to prevent flood water from entering the home. The product adapts easily to different door widths and deploys in under sixty seconds. The showcase is on between Thursday 3 and Saturday 5 July at the Business Design Centre, Islington.